​In view of the Confucius cooperation between Pharos University in Alexandria and the Chinese institutions and universities, a cooperation agreement was signed between Pharos University and Confucius Institute – Cairo University to establish the first Confucius unit to teach the Chinese language in Alexandria at Pharos University. 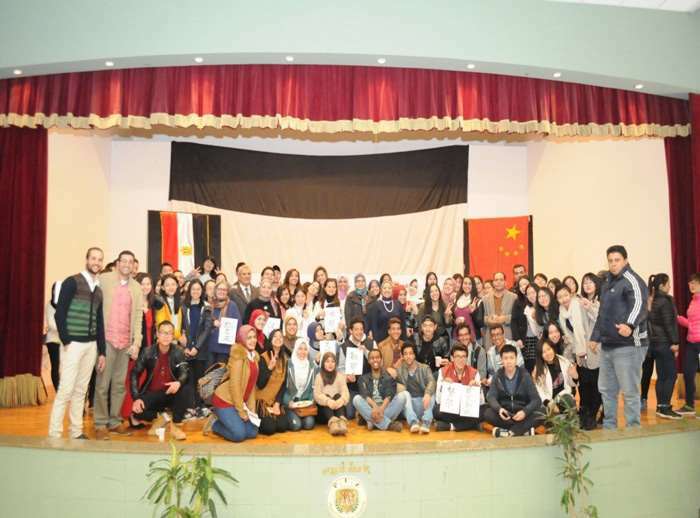 The agreement was signed during the celebration held at Pharos University on 4/3/2015 attended by The Consul General of People’s republic of China in Alexandria, PUA President, &Vice-President for International Relations and Quality Assurance, Dean of Faculty of Languages and Translation, Dr. Wahid el Saeed, Head of the department of the Chinese language at PUA and Prof. Rehab Mahmoud, Head of the Chinese Department and the Director of the Confucius Institute at Cairo University. The ceremony was attended also by PUA Vice-Presidents, staff members, students and guests from the media and different institutions. Professors from the largest Chinese universities are teaching in the PUA Confucius unit. The Institute supplies PUA Unit with the necessary books and educational tools needed to improve the educational process. The PUA Confucius is expected to serve those who aim to learn the Chinese language from the Alexandrian society and PUA students.